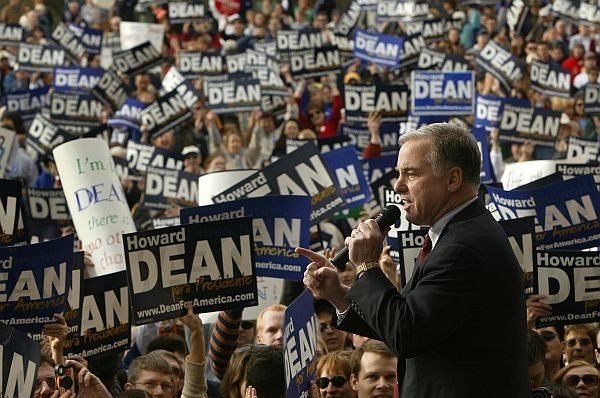 When Howard Dean, DFA‘s founder, first began using online organizing to build his 2004 presidential campaign, his campaign’s tactics were initially written off by pundits as a waste of time. By 2008, when a long-shot candidate named Barack Obama fully embraced online organizing and social media, every presidential campaign — and congressional campaign — was on board this digital bandwagon. And now, ten years after Gov. Dean revolutionized politics by empowering people to participate through the internet, candidates and campaigns at every level are organizing online. And DFA is continuing to help build progressive infrastructure by using the internet to train our members across the country on campaign strategy and tactics. Our June Night School training series is dedicated to principles and strategies for developing a compelling online presence that will engage voters and supporters. We will cover topics ranging from writing emails and online fundraising to mobilizing volunteers. Spots are limited — and June’s DFA Night School is coming up quickly. Click here to register now for various free trainings on online organizing from June 23-26. Sessions begin at 8pm Central and run for one hour. Successful email campaigns will build your online community, increase activism, and raise you money. Compared to the other online strategies, email is by far the most effective tactic to inspire action and raise money. This session focuses on how to get your supporters to open your email and engage in your action. Online organizing isn’t like throwing spaghetti on a wall and seeing what sticks. The best campaigns know their audience, develop a strategy, and execute an integrated approach that best serves both the needs of the campaign as well as the community. This session will walk through core components of building a successful online strategy. A little over a decade ago, fundraising was still dependent on how many people you could get to buy your stuff at your yard sale. But by harnessing the power of the web, online fundraising has streamlined the fundraising process, making it easier than ever for individuals to raise money. As technology gets more sophisticated, the future of fundraising is bright. This session highlights best practices for maximizing online contributions. The netroots have been critical in turning a number of races from unlikely to viable — proving that sometimes our best volunteers are behind a computer screen. This session identifies strategy, tools and best practices for successful volunteer engagement. Since 2006, DFA has trained more than 43,000 people to build their grassroots campaign skills, strategy, and tactics through our Night School program. This training is free, interactive, and online. You can sign up for one session or all of them. Based on Night School participation from this year, DFA members are clearly engaged and ready to win in 2014. More than 2,600 DFA members have been trained so far this year and we’re not done yet. DFA’s Night School exists to help people like Raye, Jenny, and Deb — or possibly even you — gain the skills and confidence to run for office and support other progressives running for office. We began with fundraising, then we covered field organizing and communications, and now we are kicking off the summer with online organizing. Every month is focused on a key skill area because to win in 2014, we need well-trained Democrats who will stand up and fight for what’s right. If you plan on being involved in a progressive campaign this year, click here to sign up for one or more of DFA’s free online trainings from June 23-26. With trained candidates and strong campaigns, progressives can win across America in November. This entry was posted in 2014 Election Campaign, Democracy for America and tagged democracy for america, DFA, DFA Night School, election campaign 2014, progressive organizing. Bookmark the permalink.